Occasionally we receive emails from people asking about what sort of footwear they need to tackle walking routes on Tenerife. Living here we can chop and change our footwear to suit different terrain and also changing seasons. 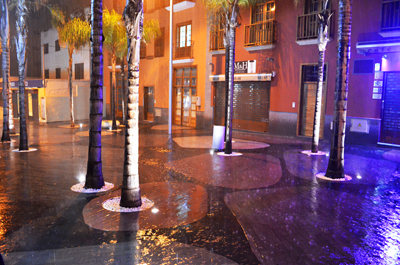 Whilst Tenerife is often promoted as the island of eternal spring, seasons do change. I always thought the ‘island of eternal spring’ tag didn’t do the climate justice as in reality it’s always an awful lot warmer than anyone from Britain is used to during spring. As a general guide, here’s the sort of terrain and weather that walkers are likely to encounter walking on Tenerife. As many people know, Teide National park consists of a huge volcanic crater dominated by Spain’s highest mountain, Mount Teide. The terrain can be a mix of foot-friendly sandy soil, hard volcanic rock and scree paths that can sometimes feel as though you’re attempting to walk on marbles. Although much of the walking can been done wearing light boots or walking shoes, boots with good ankle protection are best as the uneven, rocky landscape on the most challenging routes can nip away at unprotected and vulnerable ankles. 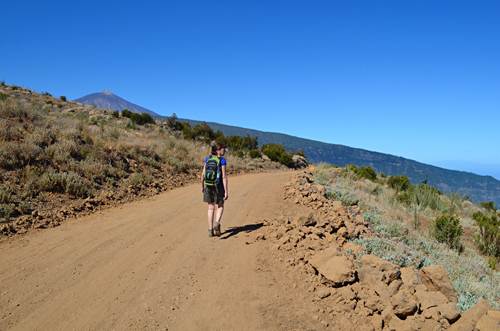 It’s not only in Teide National Park where you could end up crossing rocky terrain. 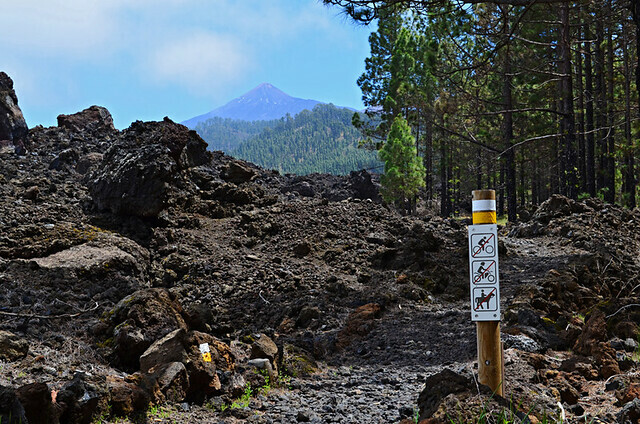 Some routes, like the one around the Chinyero Volcano, responsible for the last eruption on Tenerife in 1909, involve crossing uneven and potentially ankle-twisting lava fields. 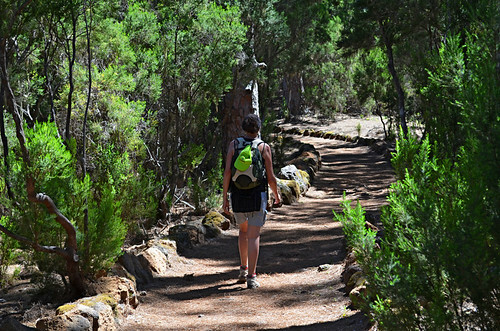 We love forest walking on Tenerife. In the La Orotava Valley, pine needles make for a soft carpet on which to walk. Pine needles aren’t so welcome when it comes to steep descents and they add a slippery element to progress. The ancient forests in Anaga can be very different as the damp bruma (low cloud) that brings essential moisture to the plants can keep sections of routes on the muddy side, especially during winter months. Saying that, most of the time we wear light walking shoes for forest routes and even open walking sandals in summer months. Lots of routes cross beautiful valleys or ascend and descend rugged ravines, the difficulty with deciding which is the best footwear is that the scenery and landscape can be incredibly diverse so can involve sandy paths, lava, forest and rocky descents. Some trails through valleys and ravines, like those around El Palmar, are relatively easy on the feet. Others, such as the Masca Barranco are borderline treacherous. We often advise caution about the Masca Barranco as it involves negotiating challenging terrain and more than a couple of scrambles. People underestimate it constantly and almost every week walkers are rescued from its depths. Solid, protective boots are best… certainly not the flip flops or heels that we’ve spotted some clueless folk wearing in there. 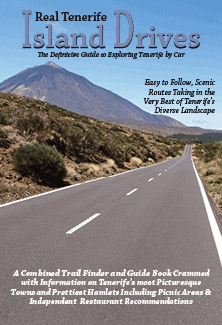 The camino real is a double edged sword and many routes on Tenerife include a camino real at some point. 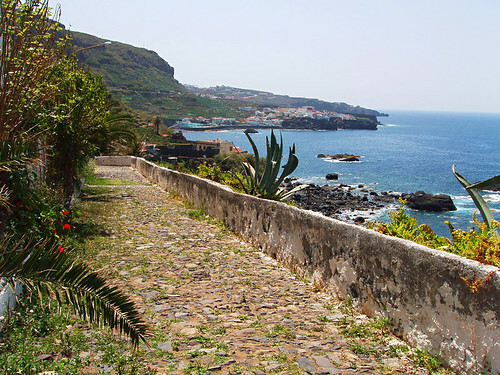 These old merchant trails are found all across Tenerife. As they were trading routes linking villages – hill town to hill town, hills to the coast, coastal community with coastal community – they’re convenient, ready made paths. This is obviously a good thing. But they’re made up of large boulders and can often be extremely uneven. They’re hard on the soles of the foot and require care and attention during descents. Because the boulders are often of different sizes there’s a need to constantly adjust the length of your step. They might be make useful paths but they can be hard going on the joints. Again solid ankle support and a thick sole make walking on them less arduous. Coastal paths mostly have less ascents and descents and so offer relatively unchallenging walking. They’re usually a mix of hard earth or camino real but as they’re relatively flat, light walking shoes can deal with them. 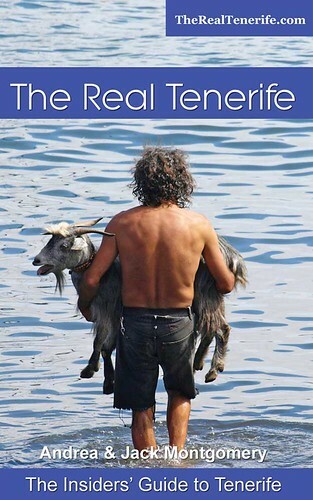 Because of the year-round good weather on Tenerife, the weather isn’t really that important as far as footwear is concerned… most of the time. Generally speaking at certain times of year there is a greater chance of rain; the end of Oct/Nov and Feb/March so footwear that keeps out the water is sensible at those times. In summer months, it’s going to be very hot and the higher you climb, the hotter it will be – light footwear and good walking sandals feel very kind to feet. 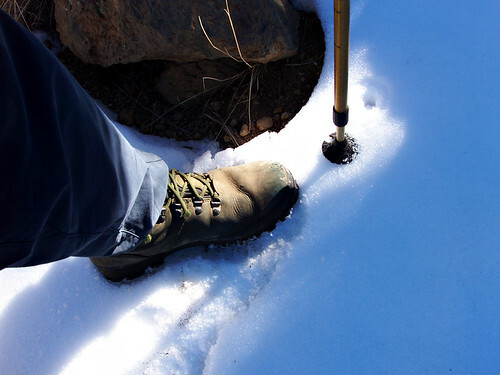 In winter the chances are it’s going to snow in Teide National Park at some point, so whilst you might find that you’re walking in a tee-shirt, you’ll still need to keep the feet warm and dry. Luggage restrictions are just that… restrictive. Heavy hiking boots take up a lot of space and use up valuable weight allowances. The truth is that most of the time I find heavy boots make my feet far too hot walking on Tenerife. 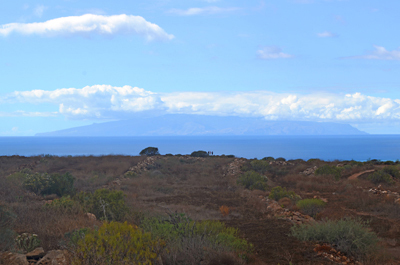 The best all rounders for Tenerife’s diverse landscapes are probably light walking boots. Have a look at our Island Walks page for more information on terrain and landscapes in different areas. ClareNovember 8, 2012 Hi, great pics and nice walk. I’ve just been to Lanzarote Timanfaya National Park seems to have restrictions on acsecs? 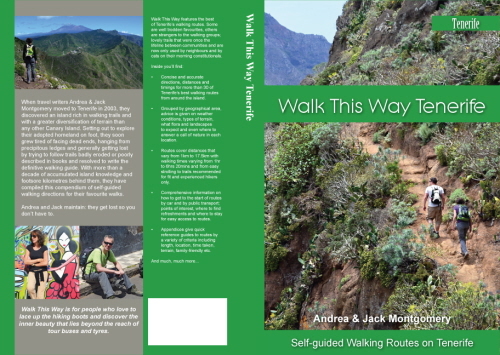 Do you know if you can walk up the mountains in Lanzarote or do you need a permit/guide/something? We wanted to walk them, but the impression we were given was that it was very restricted acsecs through the National Park. 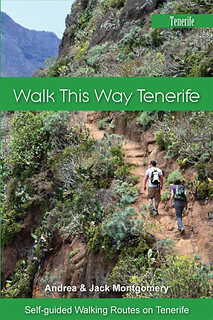 Your pics have made me consider Tenerife and some decent walking for our next holiday. 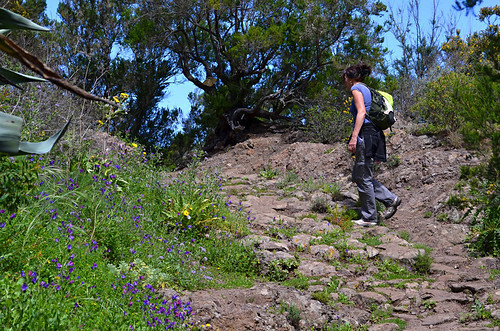 In our view, the western Canary Islands (Tenerife, La Gomera, La Palma, El Hierro) offer the best walking but all the islands have excellent walking routes. There are restrictions in Timanfaya, but we’ve enjoyed plenty of great walks in other parts of Lanzarote where you don’t need a permit to walk. The island’s government have created a network of routes all over the island. Hi, beautiful pictures. 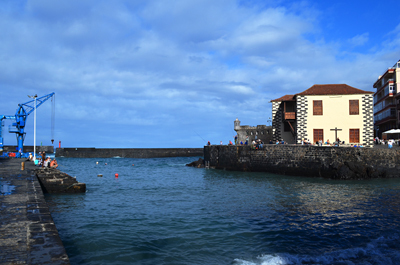 Is it possible to rent hiking boots somewhere around Puerto de la Cruz? Hi Anja, Im afraid I’m not aware of anywhere that rents walking boots. You really need to have your own walking boots if you’re going to be spending time walking on Tenerife and preferably you need to have worn them in a bit so you don’t experience any rubbing or blistering. If you’re only going to do some light, coastal walking, then you should be okay with sturdy walking sandals or trainers with good grip and thick soles. I would suggest you wear your footwear on the aircraft to avoid excess weight but if you really don’t want to carry any footwear with you, you can pick up a decent enough pair of light walking boots at Decathlon in La Laguna for under €15.